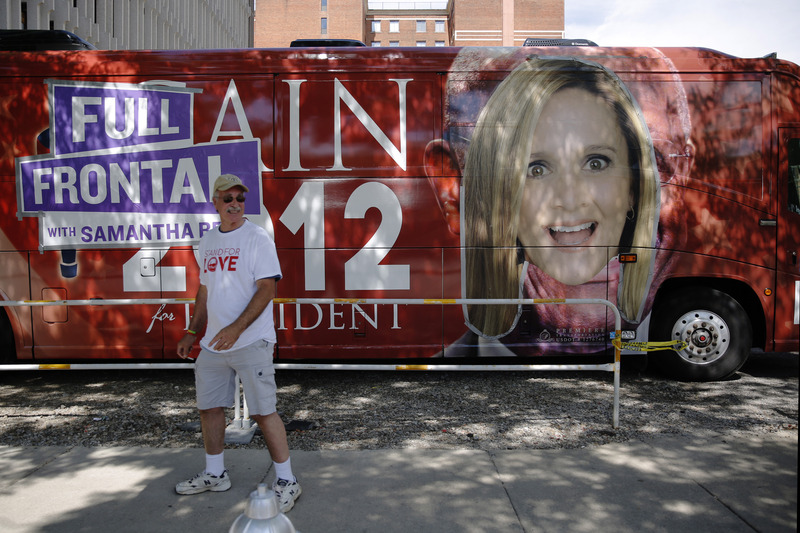 Samantha Bee is on her way to the Republican National Convention, but she's not about to fly to Cleveland — as Bee says, "You can't talk to voters from an airplane!" So, how is the late-night show host making her way to the convention? Well, believe it or not, the Full Frontal team is taking a bus to Cleveland — but not just any bus, Herman Cain's old campaign bus! (Don't remember Herman Cain? Let's just say he ran for the GOP presidential nomination in 2012, and it didn't go too well.) However, Bee didn't drive her bus straight to Ohio, instead Full Frontal stopped in Pennsylvania — another so-called "battleground state" — to meet with voters before heading on the convention. Needless to say, Bee's Pennsylvania pit-stop was worth it — the voters had a lot to say about the upcoming election, and of course, the candidates. Everywhere the bus stopped — did I mention Scandal's Tony Goldwyn was the bus driver? — Bee found enthusiastic Trump supporters. One of the first voters Bee met with referred to herself as a "Trumpette" who wants, "Trump to trumpet all over the world and help us put this country back together." Yeah, there was an unusual amount of trumpeting in this episode. However, it was actually Bee's coworker, Allana Harkin, who spoke to some of Pennsylvania's most ardent Trump supporters — at a county fair, of course. "I don't really see him as a racist in my point of view. Just because of people I know who consider themselves racist," one man said of Trump. As for Clinton supporters, Harkin couldn't seem to find any at the fair — but the voters Harkin did speak to sure had a lot to say about the presumptive Democratic nominee. "I don't see it being a smart idea to be putting a woman in office. I'm not sexist or anything...it's my opinion," said one man Harkin interviewed in front of the carnival games. Surprisingly, the woman standing next to the "not-sexist" man agreed: "I feel the same way he does. We don't need a woman as a president, we really don't. We're too dramatic!" Bee's response to all this? "The voters have spoken..."
Bee's bus did finally arrive in Cleveland (with Tony Goldwyn aka President Fitzgerald Grant at the wheel), but viewers should be glad that Full Frontal stopped in Pennsylvania for more than a bathroom-break — even RNC delegates are unlikely to give Bee as strong fodder for Full Frontal as the Pennsylvania voters. Yet, Bee seems pretty excited to be in Cleveland, and said so during the Wednesday night episode: "We're a political satire show, so of course we wanted to go to the Republican National Convention — unlike most Republicans!" Full Frontal's time in Pennsylvania was hilarious, so it's a safe bet that Ohio will be, too.